Urban Mobility in Greater Cairo: A history of patchwork solutions. When I set off several months ago, on writing this article, one thing was really clear to me: There is no single article or book that covers all the different aspects of urban mobility in the level of detail that I needed. For example, why isn’t there enough literature on the Cairo Transport Authority (CTA) and its organizational history, despite it being the major bus/tram operator in Cairo? How did all the trams eventually become state-owned though they were originally constructed and operated by private companies? Why did buses bulge under the pressure of the expanding city as it grew more dependent on motorized mobility? This article is not an academic study of the issue and it is not inclusive of all the different aspects. But what I try to do here is shed light on the organizational and structural problems that created the urban mobility crisis in Cairo by taking a journey through the history of public transport in Cairo, and discussing how it evolved into what it is today. First, I start by looking at how it all began in the late 19th century. Then the article touches upon the early attempts by the state to control the operation of public transport in Cairo, the impact of the 1970s’ economic crisis on the bus and tram networks in Cairo, the international attempts to support Public transport in Cairo (with a specific case study on a World Bank project in Central Cairo) and moves into our contemporary times with the Cairo Metro projects, the Mubarak era and beyond. The article ends with a brief section, pointing to the overlooked aspect regarding public transport and urban mobility in Cairo. At the turn of the 19th Century, a dilemma appeared as Cairo expanded much further than its narrow Fāṭimid and Mamlūki alleys. As the city began to expand slightly beyond its walkable limits with the construction of the area currently known as Downtown Cairo, local residents had to rely on horse-drawn cabbies (Chalcraft 2012) that monopolized transport and usually overcharged for trips, or use donkeys as a form of private mobility. However, that began to change as riding donkeys was considered less fashionable and comfortable, also with the introduction of Cairo’s first trams and horse-drawn Omni-buses by the 1890s (Chalcraft 2012). Despite being comparatively expensive at the time (‏Kilani, 1968), many people used the new services, and by 1914 the tram was a major form of transportation in Cairo, Alexandria, and Port Said (Chalcraft 2004). The neighbourhood of al-`Ataba al-Khaḍra – now simply known as al-`Ataba – was the center of all trams in Cairo and also boasted couple of major hotels and the al-Azbakiya Garden (Chalcraft 2012), as well as the major cultural symbol of the time: The Royal Khedive Opera house and its garden. In addition to the Belgian-owned Cairo Tram Company, there were two other local companies that operated the buses: Maqqār and Sawāris. To expedite the performance of these newly established public transport services, the government banned the cabbies from using a newly paved throughway (which once used to be al-Khal īj al-Maṣri1 ) to allow for the speedy operation of trams. This was one of the early examples of how the government tried to support the monopoly of transport, favoring in this case mass transit over other traditional forms of private mobility. On the other hand, the cabbies and other local transporters adapted their strategies to the Government’s decision banning them from the major throughways, either by operating shuttles from the terminus stations of the tram, or in areas where trams were yet to be introduced. In addition, they operated at night after the last trams would run their course. Others acquired new skills, such as learning English and improving their cabs. Such adaptations are also examples of how the private and informal sector responded to changes in business; this can be seen today with the microbuses that adapted their routes to act as feeder buses around the Cairo metro stations, especially to and from informal areas (Sims 2012). After the July 26th 1952 Revolution, Abū Regīla – A famous local businessman at the time – spotting the need for improved bus services, decided to invest in the transport sector by opening a new bus company (also named Abū Regīla). Little information exists on the operations of these bus companies, whether Abū Regīla’s or the bus companies that existed before that, yet from the few anecdotal stories from Al-Ahrām and other newspapers, Abū Regīla was the most famous bus companies and provided the best service, in comparison to the two other companies, Maqqār and Sawāris. However private involvement in public transport ended with the Presidential Decree No. (117/1961), as the government sequestrated banks, insurance companies and some of the major companies (possibly including the 3 bus companies).2 President Gamāl `Abdul-Naṣṣer issued Decree No. (1360/1959) which established the Cairo City Transport Institution (CCTI) (note difference between Institution and Authority later in this article). Article 3 of this decree stipulated that the CCTIs management board would be headed by the Head of the Cairo Municipality, and members would include representatives of the Ministry of Municipal Affairs and the Ministry of Transport. This is the first record of a city wide governmental agency owning and managing a public transport facility in Cairo. The CCTI preceded the modern-day Cairo Transport Authority (CTA). Legally, CCTI continued to exist as an institution run by the Cairo Municipality until 1964. After which it was transferred under the Egyptian Armed Forces through Presidential Decree No. (1460/1964). Meanwhile, Law No. (61/1963) created a new mechanism to establish General Authorities/Agencies [Hai’at ‘Amah]. Unlike Institutions, the ‘Authority’ was a novel form of a government body that in fact resembles a company and has its own board and can draft its own management and employment regulations, unlike a regular government agency (Egyptian Presidency/State Council 1963). This tendency to bureaucratize and shift to state-capitalism economy was rife at the time (Sullivan 1996) and this could have possibly contributed to the troubles CTA later faced as the state shifted funding and focus away from public transport and more towards catering for private vehicles and building new roads. In light of the above law, the CCTI was transformed into an authority in 1964 3 and got its current name “Cairo Transport Authority” (CTA). Then one year later the Authority was subsumed under the Ministry of Transport as a result of Presidential Decree No. (3579/1965). Due to the lack of access to secondary sources on the matter, it is hard to analyze how the conflicting decrees – and the pace at which they were issued – affected public transport services provided in Cairo. Some indications could be inferred from noting the frequently changing source, type, and technical specifications of CTA’s fleet. For example, as the older tram sets went out of service without repair, new street cars were purchased from the former Czechoslovakia in the early 1970s, only to fall apart a few years later (Zaumseil n.d.), and replaced afterwards by Japanese sets. This was also noted for the buses and trolley buses (which no longer exist in Cairo).5 . Apparently, there was no specific policy to maintain and renovate the old rolling stock of buses (it wasn’t clear if they worked on tram projects at the time), and this is what the World Bank tried to address with its project in 1982, which this article will turn to later, with somewhat limited success. What can be deduced, on the other hand, is that the state of public transportation after 1952, specifically post-1970s when the CTA was no longer under the Ministry of Transport’s authority, was rather deteriorated. During this time period, the city’s population was rapidly growing, and road-based transport was taking a higher priority within Cairo’s urban plans, while on the other hand the Authority was underfunded, which resulted in overcrowded and deteriorated CTA buses. By the 1970s, cars became more affordable to the middle class as a result of the economic open door policy and a general state policy towards preference of private mobility – especially with the emergence of new neighborhoods and new desert satellite cities (Huzayyin, Salem 2013). This led to a significant increase in traffic volume due to a surge in car traffic and reduced capacities of CTA, lack of bus lanes and financial allocations from the government. On the other hand, salaries across most sectors stagnated (World Bank Group 1993), which led to a brain drain of many of the skilled cadres working in government agencies. CTA itself lost many of its skilled drivers and administrative staff, to the extent that at one point it had to recruit conscripts from the Egyptian Army to run the buses until they could hire new drivers (World Bank Group 1993). This made the situation even worse as many of these new recruits damaged CTA equipment due to their lack of training and experience (Ibid). In an attempt to find a solution to their crisis, CTA turned to support from International agencies such as USAID and then the World Bank. The first donor-funded public transportation project was by USAID, which gave CTA several buses to operate on its lines (Sullivan 1996). They were run under a semi-public company (still regulated by CTA) called the Greater Cairo Bus Company. People called them “Carter buses” after President Jimmy Carter, the United States President at the time. These buses however were too loud during their operation, and broke down sooner than expected, and were eventually sarcastically referred to as “Carter’s Prank”. Despite these initially, and possibly unsuccessful interventions, perhaps the most prominent was intervention funded by an International organization was the 1982 Greater Cairo Urban Development Project funded by the World Bank. The World Bank project started out with an ambitious idea: to introduce low-cost yet transformative projects that can alleviate the urban mobility crisis in Cairo at the time. By the end of the 1970s, Cairo local authorities, along with the National Roads and Bridges Authority embarked on a series of projects that aimed to improve vehicular mobility along the major urban corridors. This included building the 6th of October Bridge (an elevated expressway connecting east and west of Cairo) to solve the traffic jams and bottlenecks along the Naṣr City-`Abbasiya-Downtown-Muhandisīn urban corridor. The evolution of modal share of motorized trip (%) (Huzayyin, Salem 2013). Naṣr City and Muhandisīn were both newly built districts at the time with different background stories. Nasr City was the brainchild of the Egyptian urban planner Sayyid Kuraim. Built in the desert between Heliopolis and `Abbasiya, it was originally earmarked as the new capital of post-1952 revolution Egypt (Cairobserver 2015). On the other hand, Muhandisīn was built on agricultural land on the western banks of the Nile (Sims 2012) previously owned by al-Awqāf Authority [the Islamic Endowments Authority] (‏Tarabili 1996). It also became a post-1952 icon despite the fact that original plans for Muhandisīn were made in 1944 (Sims 2012), and it was slated along with Nasr city as a middle-class housing area. Naturally, huge volumes of traffic started to flow across both sides of the city, as people commuted from home to work, either in the expanded areas or in the center of the city. The downtown area stagnated with an avalanche of private vehicles. The newly built areas relied heavily on cars. Hence the World Bank project had multiple initial objectives: (a) initiate a revised approach to urban transport based on low-cost traffic engineering and management measures; (b) strengthen the capacity of Cairo and Giza in the planning and management of urban development projects; (c) improve the efficiency of public transport in Greater Cairo; and (d) improve the living conditions of the urban poor in Greater Cairo (World Bank Group 1982). The project consisted of six components: traffic engineering and road maintenance (including the construction of two public parking garages), enforcement of traffic rules, institutional development, area upgrading, public transport (the construction of a major bus overhaul facility in Gisr al-Suez neighborhood), and a study to identify a high capacity east-west road (World Bank Group 1982). However, the project’s plan was only partially implemented. The World Bank report acknowledged that in addition to the lack of a shared vision with the Cairo Governorate, it also failed to “identify at appraisal the limited absorption capacity of the implementing agencies.” It was thus alluding to the CTA’s incapability of conducting complex international contracting procedures for the bus overhaul construction, and Cairo Governorate’s inability to implement the traffic related provisions of the agreement. Given the limited impact this project had on the CTA and the state of public transportation in Cairo, the project only added further debt to the CTA (World Bank Group 1993), leaving it with an underperforming bus overhaul facility, and two under-utilized parking lots (al-`Ataba and Opera garages) in downtown Cairo. This project raises important questions about the role of the Cairo Governorate and CTA in directing the World Bank funds to serve as another patch in the mesh of policies whose primary goal is facilitating the mobility of private vehicles, rather than public transportation. Where is the logic of building two large garages in close proximity of each other? Not to mention that one of the garages was built – with World Bank funding – on the remains of the Royal Cairo Opera that burned to the ground in 1971, which is still a controversial point to this day. Since this was an important cultural center of Cairo, why was erecting a multi-floor parking garage considered instead of rebuilding the Cairo Opera on its original grounds or turning it into a cultural center (with an underground parking lot under it)? Why the rush into locking the city into a path of primarily catering to cars rather than following the overall approach that the World Bank project proposed? Another important aspect of this specific World Bank project, is the Gisr al-Suez Bus Overhaul Facility (GESBOF). Built in order to save the CTA an estimated USD 150 million in bus repairs and replacements annually (World Bank Group 1993), it is claimed to be one of the biggest bus overhaul facilities in the Middle East. According to the World Bank project completion report, GESBOF could only achieve such savings for CTA if the maximum capacity for these production lines are utilized. The same report warned that only 3 out of 5 production lines were active at the time of writing the report, which meant that the GESBOF would not cover its costs and even warned that this could break the Cairo bus system due to the debts incurred (World Bank Group 1993). The main reason why GESBOF underperformed at the time of the World Bank report was due to the lack of spare parts that could be used to conduct bus repair and overhaul operations (World Bank Group 1993). This problem seems to have persisted and continued well to this day. In 2012, the workers of GESBOF threatened to strike from work until all spare parts needs are fulfilled. It is not clear whether this was addressed by Mona Mustafa, head of CTA at the time, or not. During a visit by Dr. Galāl Sa`īd – Cairo Governor at the time, currently the Minister of Transport – to GESBOF last year, one of CTA officials explained to the Governor that the GESBOF has 5 production lines and only 2 lines were in use. This is a decline from the rate documented in the World Bank report as underperforming. It is clear that the World Bank’s recommendations that didn’t fit the Cairo governorate and National Government’s vision were not implemented, and that there was a focus on “most capital-intensive investment projects (the metro, elevated roads, viaducts), with only marginal improvements to the traffic and public transport that remain on ordinary city streets” (Mitric 1992). Although the Metro as a capital-intensive investment, its network – regardless of its current limited reach – carries a large volume of passengers across the city (Huzayyin, Salem 2013) and acts as the backbone of the transportation system (Huzayyin et al. 1990), along with the buses and microbuses which act as feeders connecting the nearby areas to the metro (Sims 2012). Yet, the capital intensive projects that support private vehicles only serve the car owners, which according to El-Dorghamy (2015) and Sims (2012) are only 11% of households in Greater Cairo. The remaining 89% of households have to bear with the consequences of limited investments in public transportation in the city. Mitric (1992) predicted that no matter how many travelers were diverted from ordinary streets to the new viaducts and elevated roads, new trips will be created as there is a substantial suppressed demand for mobility. He was also doubtful if the city or state budget would have enough funds to keep up with new traffic generated by these roads. Even though only 5 stations of that line would be underground, the project faced immense pressure from all sides. There was a lot of opposition by locals (and the Cairo Governorate) because some of the utilities had to be cut and rerouted. Also, much of the underground infrastructure was not fully documented at the time which meant there were unexpected utilities interruptions due to the construction works. To overcome that hurdle, the NAT purchased a special earth scanning machine to detect all the different utilities underground. Despite initial pains, the metro has been the most successful and considered of one the major achievements of the former President Mubarak (Golia 2015). Yet, the construction of the ensuing metro lines has been slow and way behind original schedule (Sims 2012). The Japanese International Cooperation Agency (JICA) provided the government with a plan (JICA, 2002) – called CREATS in some of the literature (Huzayyin 2004) – that envisaged a network of four metro lines, including the two and half existing lines, and the construction of a super tram and suburban rails services (named the East and West Wings) connecting Cairo’s center with the extensions of the city by 2022. Despite the comprehensive plans placed by JICA and the other agencies, the National Authority for Tunnels (NAT) in the end set its own plan based on separate components from all the different proposals submitted. By 2050, the NAT plans to complete the remaining three lines and to have a total of six metro lines as shown in the below figure. As evident from the different figures, the NAT opted for a more metro-rail intensive solution and completely brushed aside the super tram and the West Wing. The East wing was re-introduced as an idea after the proposal to build a new capital. The super tram would have served more areas, yet would involve a much higher level of organizational coordination and planning than metro projects which are mostly conducted by the NAT. Hence the continued use of patchwork solutions to avoid the structural challenges and issues related to lack of funding from within the city or national budget. In fact, Bahgat et al. (1999) claims that the tram network was reduced partly due to completion of the metro projects. However it would rather make more sense to see the tram network that existed as essential feeders and people movers, complimenting and working together with the metro. A map compiled by Maxmilian Dörrbecker (n.d) with both the entire tram network – at its maximum reach in 1958 – and the metro lines 1,2,3, is a good demonstration of this possible inter-modality and connectivity. 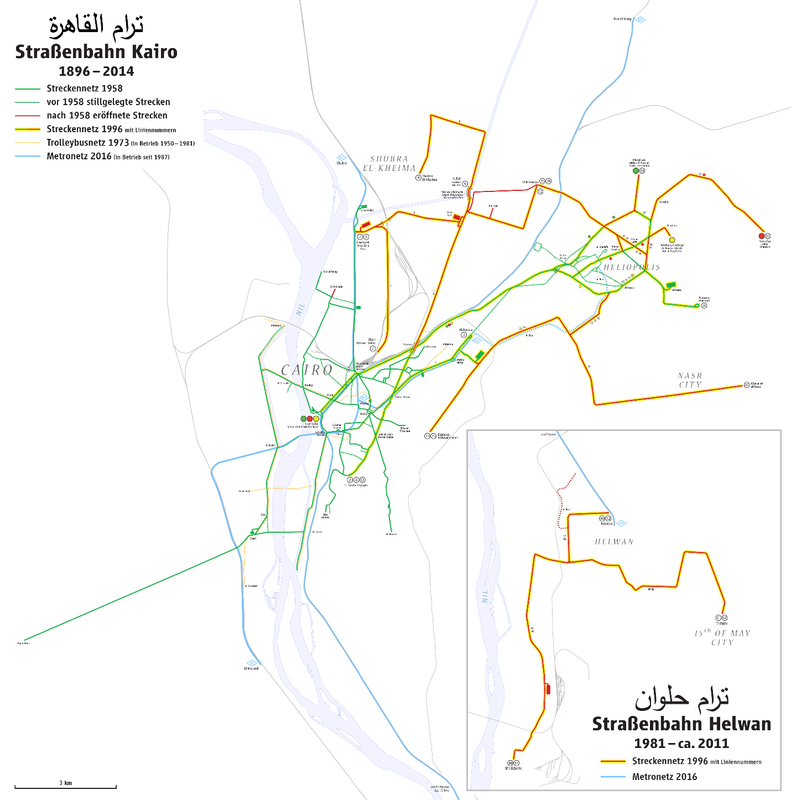 Cairo Tram Network since 1896 – with overlay of the metro lines. Interconnectivity between the tram and the metro could have been the bread and butter of Cairo’s Urban mobility (Dörrbecker n.d.). The above map shows how the tram and metro would have worked perfectly together to support the public transportation system of Greater Cairo, given that the rolling stock and tram infrastructure is also kept up to date. The new rolling stock introduced to Cairo’s tram network was in 1982 (Bus Planet n.d(b)). Yet, it is not clear why the CTA or NAT, or any of the planning agencies didn’t continue using the trams as part of the modal split and renovating them, not only to become an integral part of the network but also to provide multiple alternatives for public transport users. This would make sense especially in a densely populated city like Cairo, whose current transport system doesn’t appropriately accommodate all the demand (UNDP 2015) – at least in an efficient manner. Although Mubarak became President in 1981, the main characteristic associated with his era, i.e. bureaucratic stability (also known as Mubarakism), only became evident within the transport sector by the late 1990s and the early 2000s.7 As per the available online archive of mainstream Egyptian newspapers, the CTA was always a hot topic in the local press, including the occasional workers’ strikes demanding better salaries or work conditions, and scandals regarding the misuse of funds to buy uniforms for CTA staff that were never used. The deteriorated, overcrowded, irregularly-serviced buses and the traffic congestion were getting some highlights by journalists, who approached officials to hear “their solutions” to the crisis. The main reason given as to why the service was deteriorated was the lack of funds from the government to support the bus or the public transportation system. Cairo metro escaped from this conundrum, thanks to international funding, and despite being a consortium of work between local, national and International agencies, it was attributed as one of Mubarak’s personal achievements. This however is not sustainable and the Ministry of Transport continues to look for innovative solutions to fund its projects. Also, this period witnessed the establishment of the so-called “special service” buses that were air-conditioned and for the first time ever had the English language acronym CTA written on the side. These buses were specifically known at the time as the CTA-buses, even though almost all the public transport buses in Cairo (except for the shared taxis/microbus lines) are in fact CTA or CTA-affiliated buses. These buses aimed to cater to middle-class passengers who normally use a car, and were particularly popular with university students. Unlike the regular buses, these special service buses had a higher fare and had more comfortable seating. They continued to operate as special air-conditioned buses until the mid-2000s, only to start their own journey of deterioration. Many of them continue to operate albeit in a very deteriorated state and with rarely functioning air-conditioners (which originally justified the increased fare in comparison to the regular non air-conditioned buses). That was also around the time that a new rolling stock – Mercedes Benz buses – were introduced instead of the buses locally produced by the state-owned Nasr car manufacturing company. Meanwhile, the Ministry of Environmental affairs, conducted a project with CTA to introduce Light Propensity Gas (LPG) fueled buses to reduce the harmful emissions and resulting air pollution the regular diesel engines made. Despite these technological advancements in certain parts of the fleet, their management remained quite the same, being underfunded and unable to cope with the increasing demand for urban mobility. 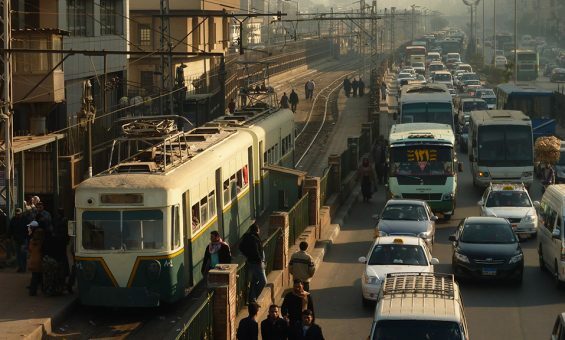 The increase in Car ownership and microbus ridership in the Greater Cairo Region (GCR) is a proxy demonstrating how increased demand on mobility was not being met by the sprawling yet traffic-trapped CTA fleet. Cairo Metro was taking over more of the demand, due to its young and somewhat limited reach, it couldn’t take any further. In addition, the Japanese International Cooperation Agency (JICA) plan to (presented to Ministry of Transport) to build in total 6 metro lines in Greater Cairo is behind schedule with the 3rd line first phase officially opened in 2013 – though the original completion schedule for the entire 3rd line was originally slated for 2016/2017. Yet, most of the remaining demand was being fulfilled by the informal sector, which in Cairo consists of small-to medium sized buses, in addition to rickshaws (also known as Tuktuks) and various forms of informal owner-operated vehicles including mini-vans, mini-trucks and sometimes private cars. Historically, the shared taxis/service also known as microbuses, emerged as a response to the increasing demand on mobility in Cairo in the 1970s. Some of these microbuses were originally licensed to operate between cities yet sensing the local demand they shifted towards transportation within Cairo. Currently there is an estimated 15 thousand licensed microbuses, although other sources suggest that there is more than 80 thousand unlicensed microbuses on the streets of Greater Cairo. These microbuses are privately organized, they don’t necessarily end their trips in terminal stations provided by the Cairo Governorate, rather on city streets, and do not run on any set schedule (Mccormick et al. 2016). In 1992, the Cairo Governorate initiated the Mass-Transport in Cairo (Mashrou’ al-Naql al-Gamā’i bi al-Qāhira) to “organize the random (informal) routes”. Yet, a series of decisions were taken in an attempt to control the microbus sprawl, including placing a moratorium hold on issuing new shared cab taxi concessions for Cairo and trying to include them under CTA’s umbrella. However, they later reverted back to another sub-division of Cairo Governorate, which led to an increase in informal microbuses and minivans spreading across the city. Many of these microbuses only operate between metro stations and nearby neighborhoods, effectively acting as feeder buses to the metro system. Yet, they remain unofficial and excluded from being an integral part of the metro system in terms of ticketing and planning. The reform projects and initiatives introduced by local, national, or international actors all formed part of the patchwork solutions towards the urban mobility challenges in Greater Cairo Region. They did indeed solve immediate issues and continue to contribute to a slightly better situation. However, with the lack of an encompassing, city-wide and nation-wide policy that re-focuses urban mobility on individuals and pedestrians, rather than a vehicle-oriented approach, we will keep on introducing patchwork solutions to the system. Even though there aren’t many studies that delve deep into explaining the problem and its structural and organizational roots, there is no lack of studies on potential solutions for the issue of transportation in Greater Cairo. Many of these studies and gray literature highlight the need to do something yet they stop short of naming the elephant lurking in the center of Cairo’s urban mobility crisis: There can be no effective solutions if there is no political willpower to embrace public transportation as a solution to Cairo’s urban mobility crisis and to divert limited public funds, which currently prioritize asphalt/road projects, to support the agencies providing public transportation in the city. We need to make use of the chances provided by such projects to scale up the solutions across the major urban mobility corridors that can reduce the challenges facing many Cairenes in their daily commutes, and make public transportation more accessible and humane for everyone. This would make our city more sustainable, people-friendly, and free from persistent traffic bottlenecks. Money is an expression of value. We should use it for the welfare of our city and its residents, not the cars. 40 ‏عاما على حريق أوبرا القاهرة «الخديوية»,‎. Available online at http://archive.aawsat.com/details.asp?section=54&article=647118&issueno=12022#.WGUrafCLTIU, checked on 29-Dec-16. Aref, Valerie (2016): Cariobserver Cairo Metro Map. 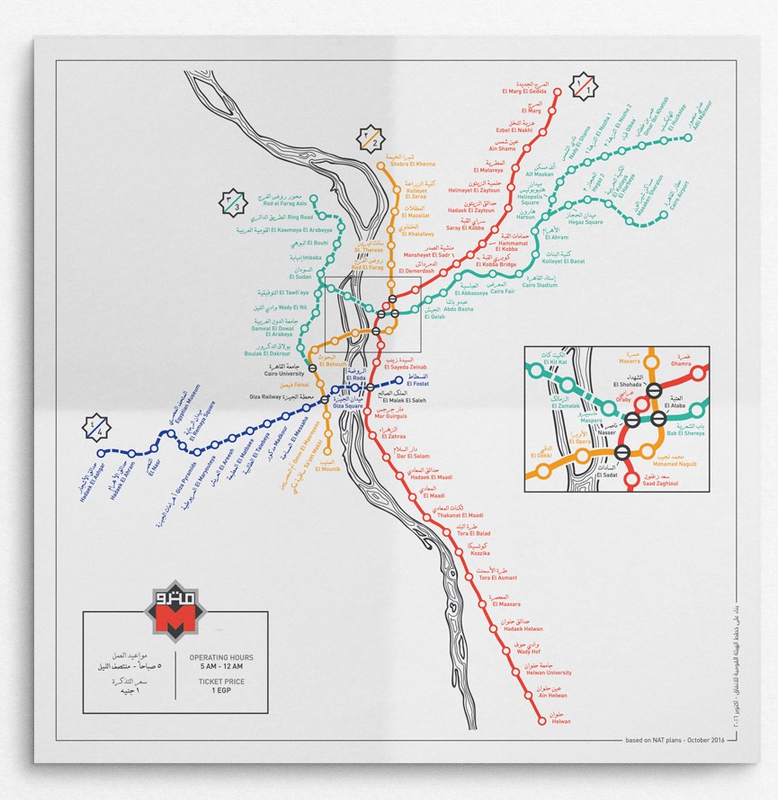 Available online at https://www.behance.net/gallery/44160053/Cairo-Metro-Map-for-Cairobserver, checked on 29-Dec-16. Bahgat, A-G; El-Tony, F.; El-Mahd, R.; Boshra, E.; Abbas, K.; Fattah, A. et al. (1999): Impacts of the Cairo Metro. In University of Sydney (Ed. ): International Conference Series on Competition and Ownership in Land Passenger Transport. Cape Town, South Africa. budget.gov.eg (2014): ‏الموازنة العامة للدولة – الأسعار‎ The General Budget for the State. Available online at http://www.budget.gov.eg/Budget20142015/Budget/702e5669-60a1-4cfb-a255-6278da3063ed, checked on 5/20/2016. Bus Planet (n.d.a): Buses in Egypt-Cairo trams. Available online at http://www.bus-planet.com/bus/bus-africa/Egypt-site/trams/Cairo/trams-6/frame.html, updated on 26-Sep-14, checked on 28-Dec-16. Bus Planet (n.db): Buses in Egypt-Cairo trams. Available online at http://www.bus-planet.com/bus/bus-africa/Egypt-site/trams/Cairo/index.html, updated on 26-Sep-14, checked on 29-Dec-16. Cairobserver (2012): All Saints Cathedral. Edited by Mohamed ElShahed. Available online at http://cairobserver.com/post/15473191972/all-saints-cathedral#.WGRaSfCLTIU, checked on 29-Dec-16. Cairobserver (2015): Nasr City was once Egypt’s new capital, but things went wrong. Edited by Mohamed ElShahed. Chalcraft, John T. (2012): Striking Cabbies of Cairo and Other Stories, The: Crafts and Guilds in Egypt, 1863-1914: SUNY Press. Egyptian Presidency/State Council (1963): Law 61 – year 1963. Law 61/1963, checked on 28-Dec-16. El-Dorghamy, Ahmed (2015): Fuel Economy and CO2 Emissions of Light-DutyVehicles in Egypt. With assistance of Hossam Allam, Amr Al-Abyad, Mattias Gasnier. Edited by EU, United Nations Environment Programme (UNEP), Global Fuel Economy Initiative (GFEI), GEF. Centre for Environment and Development in the Arab Region and Europe, checked on 5/20/2016. Golia, Maria (2015): Cairo’s Rough, Crowded, and Vital Underground Artery. Middle East Institute. Available online at http://www.mei.edu/content/at/cairo-metro-everythings-connected, checked on 29-Dec-16. Huzayyin, Ali S. (Ed.) (2004): Analyses of the evolution of travel, transport system and urban activity for sustainable short/long term transport policies; with reference to Greater Cairo. 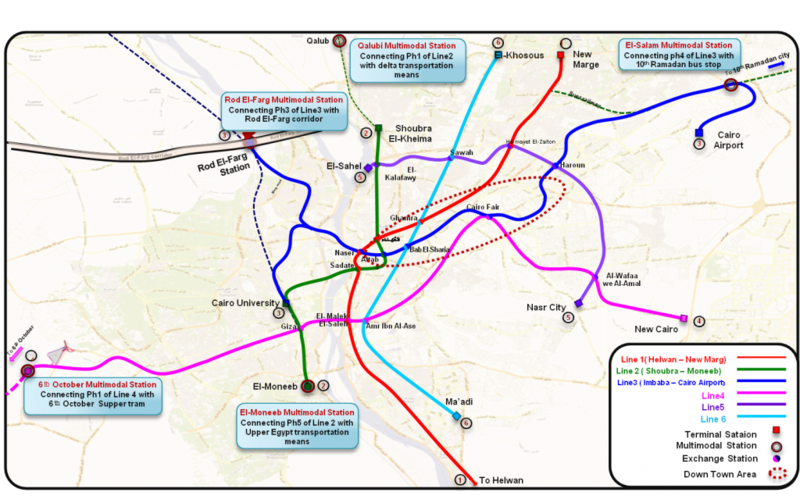 Huzayyin, Ali S.; Abd ElBary, F.; Nour El-Din, M. (1990): Cairo regional metro line: an overview of the project. In Institution of Civil Engineers (Ed. ): Rail Mass Transit for Developing Countries: Proceedings of the Conference Organized by the Institution of Civil Engineers, and Held in London on 9-10 October 1989: Telford. Huzayyin, Ali S.; Salem, Hindawi (2013): Analysis of thirty years evolution of urban growth, transport demand and supply, energy consumption, greenhouse and pollutants emissions in Greater Cairo. In Research in Transportation Economics 40 (1), pp. 104–115. DOI: 10.1016/j.retrec.2012.06.035. 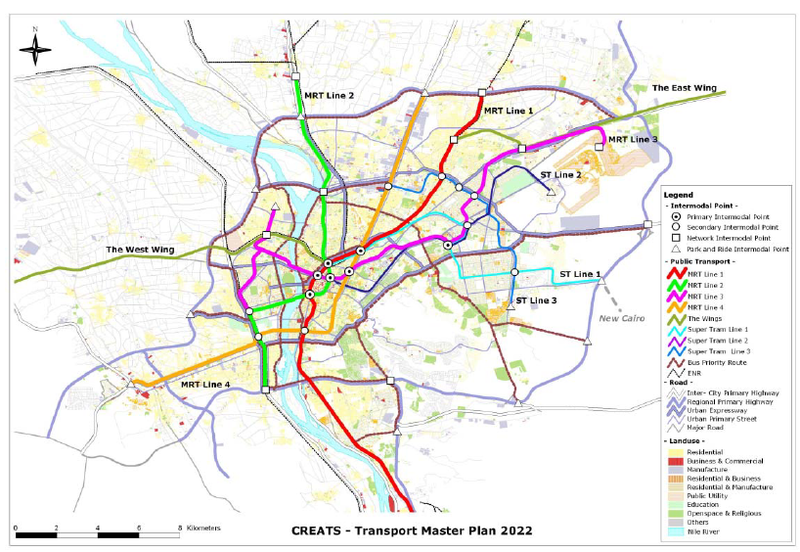 JICA, Japan International Cooperation Agency (2002): Transportation Master Planand Feasibility Study of Urban Transport Project inGreater Cairo Region in the Arab Republic of Egypt. With assistance of Katsuhide Nagayama. Pacific Consultants International (PCI), checked on 5/20/2016. Koning, Anouk de (2009): Gender, Public Space and Social Segregation in Cairo. Of Taxi Drivers, Prostitutes and Professional Women. In Antipode 41 (3), pp. 533–556. DOI: 10.1111/j.1467-8330.2009.00686.x. Mccormick, D.; Mfinanga, D.; Schalekamp, H. (2016): The nature of paratransit operations. Paratransit in African Cities. Operations, Regulation and Reform. Mitric, Slobodan (1992): Urban Transport Strategy for Cairo: Advice and Dissent. In TRANSPORTATION RESEARCH RECORD (1441), pp. 127–133, checked on 29-Dec-16. Presidential Decree (1964): Decree 1891 / year 1964. Decree #1891/1964. Presidential Decree (1965): Decree 3579 / Year 1965. Decree #3579/1965. Presidential Decree (1966): Decree 2716 – Year 1966. Decree #2716/1966. Shawkat, Yahi; Khalil, Amira (2016): The Built Environment Budget FY 2015/16 An Analysis of Spatial Justice in Egypt. A Built Environment Observatory Policy Series Paper. A 10 tooba | Applied Research on the Built Environment project, checked on 29-Dec-16. Sims, David (2012): Understanding Cairo: The logic of a city out of control: Oxford University Press. Sullivan, Denis J. (1996): American Aid to Egypt, 1975-96: Peace Without Development. In Middle East Policy Council Volume IV (4), pp. 36–49. Available online at http://www.mepc.org/journal/middle-east-policy-archives/american-aid-egypt-1975-96-peace-without-development. UNDP, United Nations Development Programme (2015): Project document: Sustainable transport. World Bank Group (1982): Project Agreement (Greater Cairo Urban Development Project), checked on 29-Dec-16. World Bank Group (1993): Project Completion Report on EgyptGreater Cairo Urban Development Project(Loan 2176-EGT), checked on 5/20/2016. Zaumseil, Jörg (n.d.): Tatra-Straßenbahnen vom Typ K5AR. www.strassenbahnen-online.de. Available online at http://www.strassenbahnen-online.de/tatra/k5ar, checked on 28-Dec-16. 1. al-Khalīj al-Maṣri was also known as the Old Khalīj; a water canal that extended from Fum al-Khalīj, at the beginning for the Ancient Aqueduct and close to where the National Cancer Institute is currently based, all the way to Bab al-Khalq area. 2. The text of almost all the laws and decrees related to CTA could not be retrieved at the date of writing this article. This Facebook post on the CTA’s official page was the only available online resource. 4. It should be mentioned that the law made an exception to this rule, in the case of the facility being of national use, or of “a special nature” which can then be specified by a Presidential Decree. 5. According to the blog Bus Planet (n.d), 200 of the “TATRA K5 car series” streetcars – produced by the Czech ČKD group – were purchased around 1970-1973 and only operated for several years before falling into disrepair. They were replaced by the Kinki Sharyo series 6001-6140 in 1978. Also, there are very little resources quoting the presence of the trolley buses, with exception of a few photos from that time period. It is worth noting that this information is only available via tram/bus fan groups online and couldn’t be officially verified at the time of writing this article. For more information, please check the following links: Bus Planet link 1, Bus Planet link 2, and here for the TATRA K5AR (K5 Articulated) (Available in German only). All links here as accessed on December 28, 2016. 7. The term “Mubarakism” was originally coined by Elis Goldberg in Foreign Affairs magazine, but also it was used by others (such as here and here) to describe the policies associated with the former President Mubarak.